Student. Born: June 18, 1904, Emporia, Kansas. Died: May 13, 1921, Emporia, Kansas. Named for her grandmother May Ann Hatten White, Mary Katherine White was born on June 18, 1904, in Emporia, Kansas, the second child of William Allen White and Sallie Moss Lindsay White. During her first four years of her life she struggled as a result of heart medication her mother had taken during pregnancy. The medication was thought to have poisoned Mary's system. The first summer of Mary's life, the family went to the Colorado mountains for relief from the Kansas heat and humidity, with the hope that fresh air would strengthen the young girl. The family would continue to vacation in Colorado. Mary enjoyed the fresh air and became stronger. In Colorado she found that she was especially drawn to the burros. By the time she turned 12, she was renting her burros to tourists and cottagers. Following in the steps of ancestors from her mother’s family in Kentucky, Mary was passionate about horses. Her mother's family raised horses, and Mary had a horse from the time she was able to ride. Her first was a Shetland pony; when she outgrew the pony her parents bought a beautiful black horse named Black Satin. A spirited animal, Mary barely escaped injury several times. Once racing across the Santa Fe tracks on Exchange Street her horse turned and ran alongside the train. Another time while facing friends, as they approached a narrow bridge, Black Satin leaped across the ravine rather than crossing the bridge. Her parents decided to purchase her a safer, calmer horse. Mary was known all over town, she walked down the street whistling and nodding to everyone. She would invite her friends to ride her pony, including her friends from the African American community. When she was in high school, Mary learned to drive. She drove her parents to many places in the family Dodge. The khaki-clad girl with flashing dark eyes, long pigtails, a red hair ribbon, and red cotton handkerchief around her neck, became a familiar figure in Emporia. She was mischievous and might accept a dare at the drop of a hat. She once filled a fountain pen with skunk oil and barely escaped getting expelled from school. She carried a foul-smelling acid from the school laboratory into a department store and the smell ran everyone out. She liked blood-curdling ghost stories and loved to put a scare in her listeners. She enjoyed life, the outdoors, and defied the conventions of her own social group to make friends with a wide circle of people. Mary was a fighter who stood up for her rights. As a freshman, Mary threw a boy nearly twice her size, held him down, and punched him in the face before the older boys pulled her off. When her parents disapproved, she reasoned that he would never pinch her again, and he didn't. An adept reader, Mary's Grandmother White read her the classics at an early age. At age seven Mary and her family would gather around the fireplace and read their favorite books by Charles Dickens, David Copperfield, The Pickwick Papers, Our Mutual Friend, and A Tale of Two Cities. 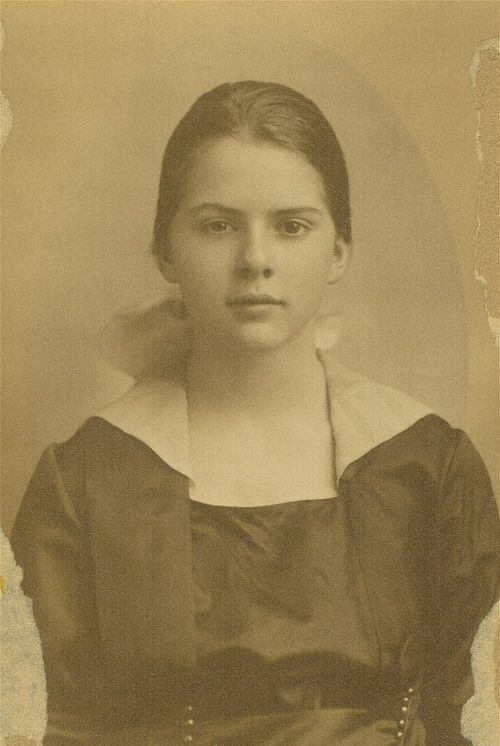 By the time she was 16 she had read all of Mark Twain’s books, some of them many times. Huckleberry Finn and Joan of Arc were her favorite reads. She began reading O. Henry, Morgan Robertson’s adventure stories, and liked to browse Collier’s and The Saturday Evening Post. She also enjoyed books of popular science, new century poets, and was a constant newspaper reader. She was a stamp collector and loved to sketch. Mary’s grades were up and down, depending on her attitude toward the teacher. She would cry about her troubles and adventures at school but ended with laughter. Her parents did not sympathize with her struggles and encouraged her to study. By the time Mary was 16 she was following their advice to gain admission to Wellesley. Even at the age of 16 she avoided dresses and detested hats. Mary disliked the special privilege of being the daughter of a famous man. She once told her teacher, with tears, “I’m so tired, so darn tired, of being William Allen White’s little girl!” She wanted to be her own person. Though she was five feet three, she wanted to be as big as her ideas. Her family found similarities in her physical habits, bubbling humor, and mischievous grin with those of her Grandfather Allen White. While not known as a warm, affectionate child, Mary cared about others. When she saw the less fortunate children looking at her on her horse, she would give them a ride. When she had a car, she offered rides to people in the community. When she saw an African American girl reading in a toilet at the high school because she had no where else to go, Mary campaigned for a reading room for black students. When a high school boy was paroled from a reformatory, many of the students shunned him when he returned to school. Mary stood up for him and he was accepted. In summer 1920 Mary spent her mornings on the YWCA grounds, half a mile away. She was interested in classical music, listening to Beethoven and Brahms. She had begun going to high school dances. In 1921 there was a tragic event on a Tuesday evening in May, a horseback riding accident. She was taken home and city officials stopped all traffic in the White neighborhood and a telephone official cut all calls to their home. Mary died of a cerebral hemorrhage early Friday morning, May 13, 1921. One of her parents' most cherished memories was the group of African American children who assembled on their lawn and mourned Mary's death as they turned toward the window in Mary’s room. The day after her funeral, her mother and father wrote her obituary. The Emporia Gazette ran it May 17, the Kansas City Star picked it up. Franklin P. Adams reprinted it in his Conning Tower column in the New York Tribune, May 24, 1921. From there it was picked up in the daily press across the nation. A woman’s magazine ran it then another and another. Christopher Morley was making an anthology and asked to include it. Alexander Woollcott put it into the first Reader and read it over the radio. Other radio entertainers used it and within a year it appeared in four books of reading for high schools and colleges. Mary's parents kept tally for 20 years, it was reprinted in more than 40 school readers or anthologies of Americana. Mary White survived in the hearts of high school and college students. In the greatest emotional crisis of their lives, William Allen White and Sallie White wrote a piece that lived and was treasured by scores of people. In a column-long editorial, they wrote the story of Mary's life. The spirit of the piece appealed to those who read it. The work has been published in more than 25 different books designed for high school and college reading. The editorial has been reprinted more than any other work by William Allen White. So the story of Mary White survived. Many memorials were established in Mary's honor. Within a month of her death. Emporia High School established a rest room for African American girls in memory of Mary’s struggles for their accommodations. Her mother furnished the room, redecorating a regular basis, and keeping Mary's effects until her own death in 1950. Over the years her parents bought 50 acres for a park that was named Peter Pan Park. In 1926 they donated it to the city of Emporia in Mary's honor. Mary's death came more than a year before she finished high school and would have entered Wellesley. The university continued to carry on her on the rolls of the Wellesley class of 1926. Five years after her death, the Wellesley class that she would have graduated with dedicated their class annual and graduation exercises in her memory. The Mary White Story was a 1977 made-for-television movie, shot in Emporia, which aired on CBS.